Dylan has always loved bath time, splashing around and playing with his toys. This week we had a special bath time though, a glow in the dark one! I turned off all the lights and shut the curtain. The one benefit of the evenings getting darker is that by bath time it is getting dark outside and there is less natural light coming in so it does make it easier. I bought a pack of 20 glow sticks from the pound shop and popped them into Dylan's already run bath. 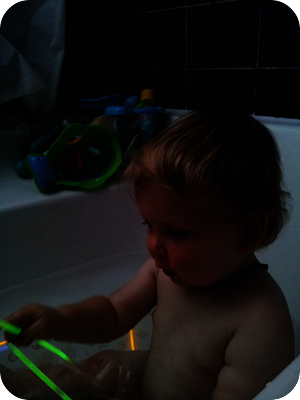 Voilà, a glow in the dark bath! 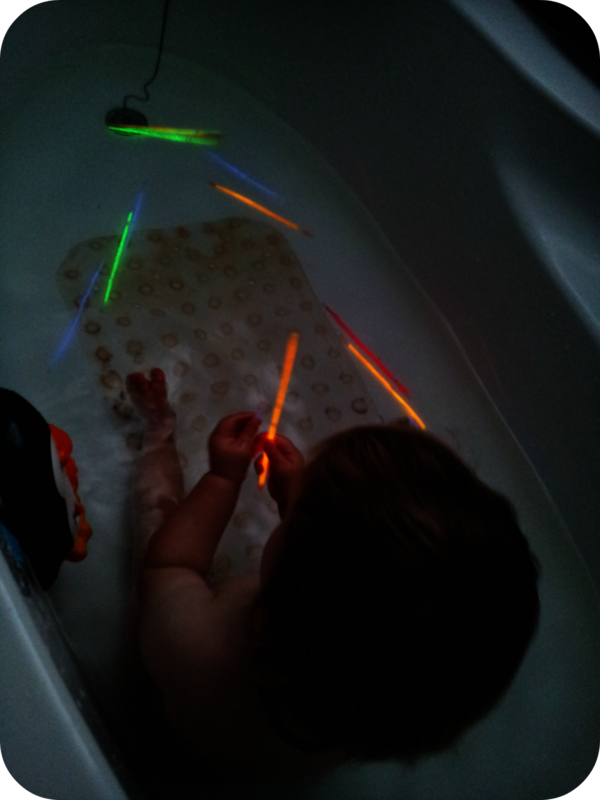 He loved playing with the glow sticks and watching them swirl around and didn't even try and eat one! (I wouldn't recommend letting them near your child's mouth.) He was in there until his skin was all wrinkled and even then he didn't want to let go off the fluorescent green stick! 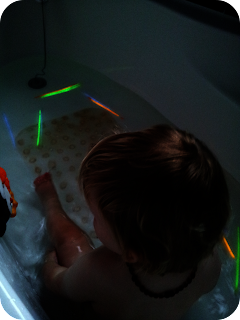 I think this is a great sensory experiment for babies who are growing out of the everything in their mouth stage and would be great for older children too - I mean who doesn't want their bath to glow! Add some music and you have your very own bath disco! I would love to tell you where this idea came from as I know I have seen it before but I have no idea of the source unfortunately. I know what I'm doing one bathtime soon...this is amazing! What a cool idea! I'm going to have to try this one - easy and looks so good - I bet he loved it!